Great legs require intense effort and smart training. Learn leg anatomy and the techniques you need to build better hams, glutes, and quads. When I started training, I was a total idiot. I didn't want to train legs and had every excuse in the book: "I don't want my legs to get too big," "I play sports, so I don't need to train legs," and of course, "Squats are bad for your knees." Whether your goal is to squat or deadlift stupid amounts of weight, build thighs that blow away your competition, or simply look great in the summer, the discussion begins and ends with a great set of legs. 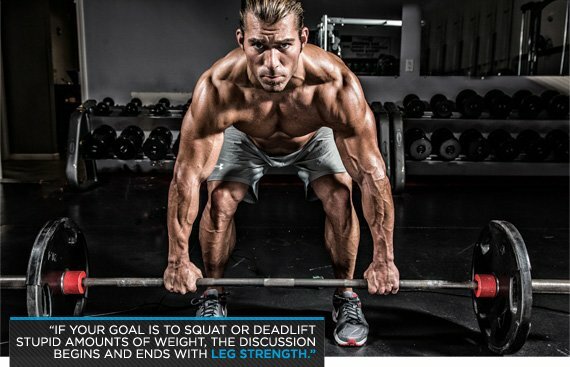 There's just one small problem: building big, strong, and athletic legs is damn hard work! That's the real reason why most people either don't train legs, or don't take leg training seriously enough to forge wheels of steel. In my not-so-humble opinion, if you're not serious about leg training, you're not serious about your training. Period. Fortunately, I finally got smart and started training my legs. My strength and hypertrophy exploded as a result. See, with the right information and the proper facts, leg training is much less of a chore. The following is a leg-anatomy cheatsheet and workout. It'll help you understand what your legs do and how best to train them. After this, you'll be looking for excuses to train legs rather than to avoid them. I know you want to talk big legs, but let's get some basics down first. There are three planes of movement: the sagittal, frontal, and transverse. You exercise on the sagittal plane when you move forward and backward. When you move side-to-side, you're on the frontal plane. Any rotation occurs on the transverse plane. Easy, right? We could make this much more difficult and super-duper geeky. But I don't think we need to focus on various movements, concern ourselves with concentric vs. eccentric motions, or worry about stabilizers versus prime movers. To make this simpler, we're going to stay on the sagittal plane. It's where you do most of your lifting, anyway. Everyone likes a nice set of glutes. Everyone. There are three glute muscles: the glute maximus, the glute medius, and the glute minimus. The glute maximus is important for hip extension—think deadlift and hip-dominant variations—but it also gets stimulated the farther down you squat. The hamstrings are an oft-forgotten muscle, and I'm not exactly sure why. Maybe it's simply because the novice strength trainer can't see their hamstrings in the mirror, so they think they're not as important as the quads. Well, not only are they important for performance, but well-developed hamstrings help distinguish and separate the front and backsides of the body. You have three hamstrings: the biceps femoris, the semitendinosus and the semimembranosus. 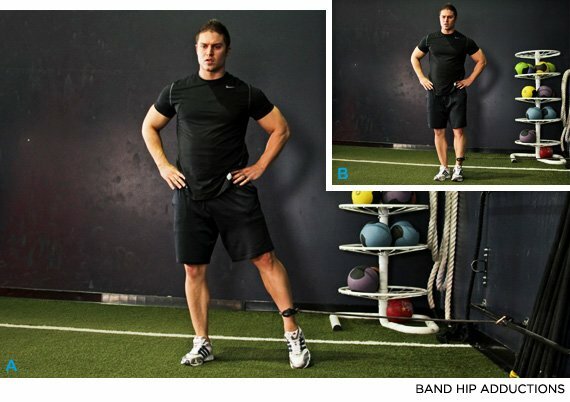 Collectively, the hamstrings work to extend the hip and flex (bend) the knee. Each of the hamstrings has a rotational component as well, but again, we're going to keep things simple. The quads are major players in thigh development. I can't remember one single person in my life that had a great set of legs who didn't also have amazing quads. Your four quad muscles are the rectus femoris, vastus medialis, vastus lateralis, and the vastus intermedius. All of the quads work together to extend (straighten) the knee, and the rectus femoris also helps flex the hip. The adductors (or inner thigh muscles) can be confusing when it comes to training because they work heavily in the frontal and transverse planes. You have a bunch of adductor muscles: the adductor magnus, adductor brevis, sartorious, pectineus, and gracilis. The adductor magnus is going to be our primary focus in this article. Anatomy geeks such as myself often refer to it as the "fourth hamstring," because of its size and ability to extend the hip. Working to balance the muscles on the front and backside of the body isn't just a good idea for aesthetic purposes, but for long-term muscle and joint health as well. When it comes to hip/thigh development, there are two things you need to consider: the angle of your tibia and whether to do an exercise on one or two legs. Let's examine each. Strength coaches like Ian King and Charles Poliquin have distinguished between quad-dominant and hip-dominant exercises for years. However, the terms "quad dominant" and "hip dominant" can be confusing. Think about it like this: there's a big difference in the shin angle between a powerlifting style box squat, and a traditional front squat, right? Just because they are both squat variations doesn't mean they're both quad-dominant! There's a big difference in shin angle between a Romanian deadlift (RDL) and your average trap bar deadlift, where the shins end up drifting forward. Instead of using the term "squat" or "deadlift" as my reference, I prefer to look at the shin angle to determine if a lift is quad or hip dominant. When the shins are angled (knees over toes), the lift is going to be more quad-dominant. When the shins are vertical (perpendicular to the ground), the lift will be more glute and hamstring dominant. The next big question is, "Should I lift with one or two legs?" There are a number of biomechanics behind this answer, but if I can really distill things down, there's a key distinction. When you lift on two legs, you have a wider base of support. A wider base of support means more stability. And the more stable you are, the greater the prime-mover activation. Think about it practically: If you want to get big at all costs, you do a bunch of machine work. Being in a super-stable environment allows you to maximally demonstrate force and hammer those prime movers. At the end of the day, more prime-mover activation equals more size. However, as you narrow that base of support—as you would in a lunge or single-leg exercise—you reduce prime-mover activation. This isn't necessarily a bad thing; just understand that reducing stability increases stabilizer activation. Increasing stabilizer activation can be great for your legs. It can work your smaller muscles in your hips and thighs like adductors, glute muscles, and small hip rotators and stabilizers. For the maximal development of your hips and thighs, single-leg work can make a profound difference. You know the anatomy, and you know you need a mix of hip dominant, quad dominant, and single-leg work in your program. Now let's put that together into something you can use! Note On Lifting Tempo: Tempo is expressed in seconds. The first number is the speed of lowering, or eccentric phase, of a repetition. The second is the pause at the bottom, or stretched part of the movement. The third number is the speed of raising, or concentric phase.